Sport business students recently participated in a business case competition, highlighting the Davis College of Business‘ efforts to make sure solving real-world business problems is a core coursework focus. 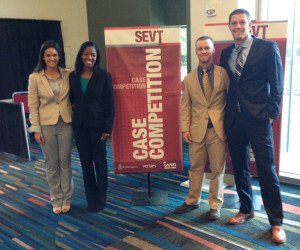 In November, four undergraduate sport business majors — Jackie Dipiazza, Sable Lee, Zachary Norton and Justin Russell — competed in The Sport Entertainment and Venues Tomorrow (SEVT) Undergraduate Case Competition hosted by the University of South Carolina in Columbia, S.C. Assistant Professor of Sport Business Dr. Todd Hall served as the adviser for the competition and faculty sponsor for the conference. Jacksonville University students competed against eight other schools to solve a real-world sports business problem. Students were given a case and were tasked with creating a solution to the problem, acting as consultants in order to make a recommendation to an event planning committee after less than a day. The case they were given was to plan a Decathlon in Ottawa, Canada, with only one year to obtain sponsorship and organize the event. 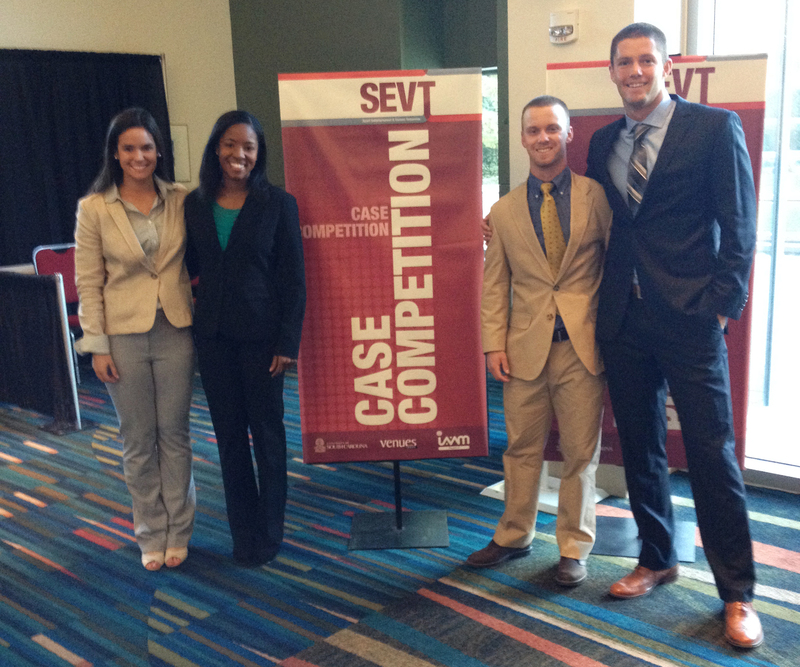 Sport Business students (left to right) Jackie Dipiazza, Sable Lee, Zachary Norton, & Justin Russell pose at the SEVT case competition. This was the first time the Sport Business department participated in such an event, with many lessons learned in applying business and sporting knowledge. “The students did a great job, and although they did not advance to the final round of the competition, they performed and represented JU very well,” said Hall. In addition to the competition, the students attended speaking engagements, took part in an internship fair and met with seasoned business executives, such as Rob Parker, CEO of Zac Brown’s Southern Ground, and Jane Kleinberger, founder of Paciolan, Inc.
Dr. Thomas, a Visiting Professor of Sport Business, attended the conference with the group as well. Other schools participating in the case competition included the University of Cincinnati, University of Missouri and the University of Tampa. Formerly the Sports Management major under the College of Health Sciences, Sport Business shifted its focus into the business aspects of sport starting in fall 2013.